Hoping to eliminate car theft in Russia, traffic police have installed a new system of real-time camera surveillance that can send an alarm signal to police if a car deviates from one of its usual routes. The system, called Spider Web (Pautina in Russian), is an analytical computer program that processes road traffic information from CCTV cameras. The system has already been installed in three federal districts and in the city of Moscow. 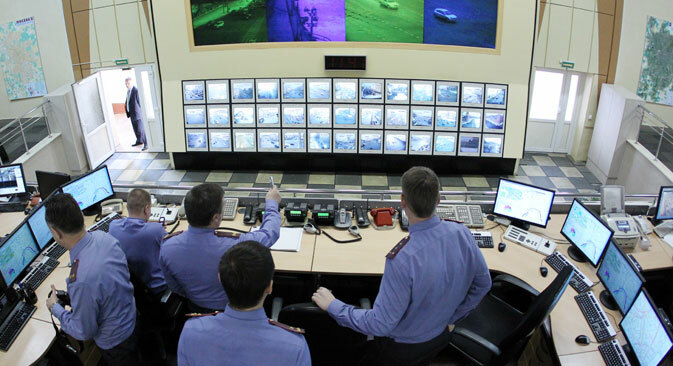 Viktor Kovalenko, Moscow’s deputy head of the road police, said that the new system will be implemented in all Russian regions, but its effectiveness could best be assessed in Moscow, where the number of CCTV cameras was the biggest: some 110,000, including 700 traffic cameras, provide photographic record of traffic rule violations in the capital. Spider Web is capable of identifying car makes. So far it recognizes only seven main makes but programmers are working to add more makes. Combining information on the car make with the visible part of the license plate, the system can identify individual vehicles even when only part of the license plate is captured. It can then check the numbers against federal databases of all types of license plates, including foreign ones. On a huge monitor at the Moscow traffic police directorate's response center, the map of the city is dotted with numerous blue rectangular figures with numbers indicating police patrol cars moving around the city. Suddenly, an orange circle appears on the monitor and the duty officer sees a message on his computer screen that says a traffic camera has caught a car that may be on the list of stolen vehicles. The officer immediately notifies the nearest police patrol of the details of the vehicle and its whereabouts and instructs them to stop it and check. Spider Web has one more capability currently being tested. Usually, a person, unless they are a taxi driver, follows the same, usual routes. Over months, let alone years, these routes become more or less set: from home to work, from work to the supermarket, from the supermarket home. Occasionally there will be a trip to the dacha and back. The system has already memorized the set routes of each of the vehicles constantly moving around the city. If a car suddenly takes an unusual route, the system can send a signal to the duty officer. Which will be enough reason to stop the car and check the driver's papers. However, unless there is a special police operation under way, nobody is monitoring all the cars all the time. Simply at some point an orange circle appears on the monitor and a message pops up on the screen that a car should be checked. The system has already proven useful during special police operations, police said. Thanks to Spider Web, the police have caught a gang of car thieves, who used license plates stolen in Belarus. "In the first 11 months of 2012, a total of 11,994 vehicles were stolen in Moscow, whereas in the same period this year, the figure was 10,251. But this is not all down to Spider Web. We have introduced some fundamental changes to the way we conduct special operations," Kovalenko said. Police were considering the option of giving motorists rights to manage some of the system's functions themselves, he said. In particular, drivers would be able to send a text message to a designated short number saying that their car has been parked and should remain in the parking lot. After another text message, the car will be removed from virtual surveillance. If however in the time between the two text messages the car is caught in motion by one of the cameras, a signal will be immediately sent to the traffic police and the car thieves will be tracked down.